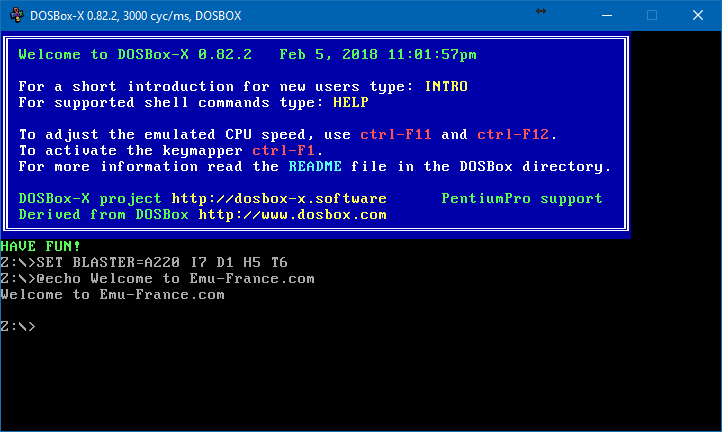 Il s’agit d’un fork de DOSBox des plus intéressant, destiné à Windows Linux et MacOS et créé par Jon Campbell. Il possède une compatibilité excellente et met l’accent sur la précision d’émulation notamment en ce qui concerne l’émulation de Windows 3.x à ME. En outre il ajoute des améliorations en provenance d’autres builds comme DOSBox ECE avec l’émulation de la 3DFX en interne. even with the common PC-98 MOUSE.COM driver. that has more than 512 bytes/sector. to advance sectors during multi-sector read/write. Fixed floppy emulation bug that prevented seeking. The « head » would get stuck at track 0 and never move. and byte count reach beyond the end of a 64KB segment. appears normally in the MCB allocation chain. BIOS now clears it’s stack before booting the DOS shell. « stuck » when emulation resumes. layout recognition added for Windows and Linux/X11. adjustments, which fixes display distortion. INT 10h VESA modes 720×480 and 848×480 fixed. so that 4bpp planar modes display properly. mode to resolve overlapping mode number. use 16-color graphics and EGC functions. Added PC-98 INT 18h function to read character font. This also resolves garbled text in TH01. game crash, fault and reset rather than normal BIOS startup. enabled or not at any time. then the normal E_Exit() path is still taken. of the PIC (interrupt controller). Added debugger command to view or change the A20 gate. handles, allocation, and EMS page frame mapping. BIOS region (0xF0000-0xFFFFF) chosen by emulation. seen in the debugger using the « DOS KERN » command. Added « RUN » command as an alternative to hitting F5. system run in the debugger is possible. regions of memory that are beyond the end of the segment. able to control the A20 gate. PC-98 mode. Arrowgun now runs properly. (and therefore not allocating extended memory through HIMEM.SYS). PC-98 mode can now use this API to access extended memory. memory values when claiming extended memory. trailing edge of text RAM (A3FE0-A3FFF). see keyboard input, and determine the boot drive properly. It is now possible to boot MS-DOS in PC-98 mode. PC-98 GDC dip switch 2-8 emulation fixed. It was backwards. consumes extended memory instead of conventional memory. root of the filesystem as directed by the Finder. sector is loaded at just under 128KB. Build updates to support compiling for Windows with MinGW. the debugger when the boot sector begins to execute. if the user wants to better understand why I locked it out in PC-98 mode. PC-98 support now supports reading font from FONT.ROM, if available. home/end keys as a user would normally expect. instead of mapping directly to any specific window. the title bar of each window hilights if it is active. Debugger interface now hides the « variables » window by default. on modern systems looks better than hyphens. Removed one line padding around data window in debugger interface. the DOS application requests to map pages into the EMS page frame. run with the A20 gate turned off.